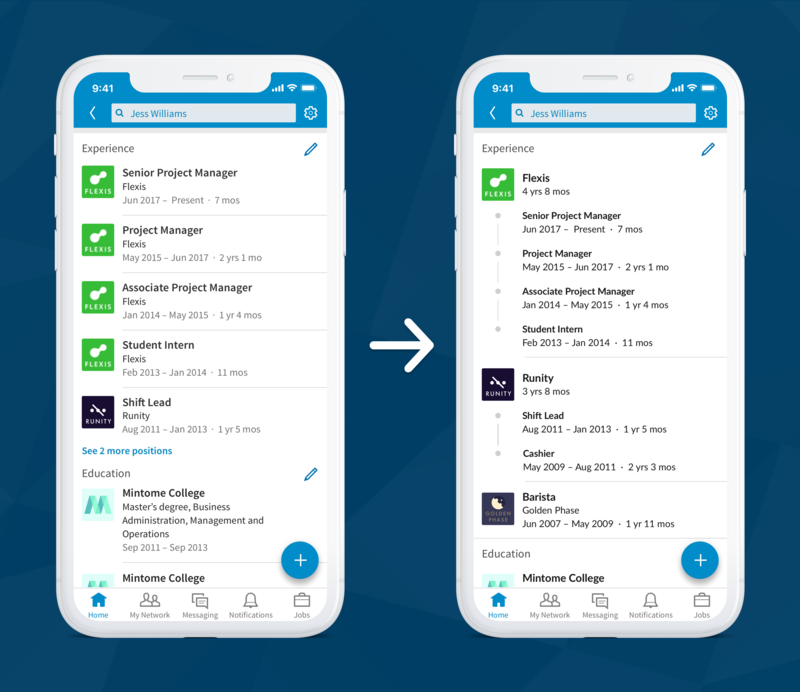 LinkedIn is adding a new option which will enable users to more accurately represent their career movements within a single company, by listing internal shifts under one banner on your LinkedIn profile. It works like this – as you can see from the above example, the new format will automatically detect movements within the same organization and categorize them into a single listing, with each job role change included, dot point style, under the main heading. Again, you can see this in the example above – as each position ends and starts within a month (i.e. one role finishes at ‘June 2017’ and the next one starts at ‘June 2017’), and importantly, each position is linked back to a relevant company profile, LinkedIn’s system can determine that these were all within the same organization, and list them under the new process. The change may require a re-check of your LinkedIn profile – while you should be regularly updating your LinkedIn profile anyway, the new format could mix up your presentation, and you probably want to take a look and ensure it’s all listed as you would like. But also, don’t be surprised if you’re not seeing it as yet – LinkedIn says that the new design is “starting to roll out in the U.S. this week” on both desktop and mobile, and will be available globally to all members “in the coming weeks”. It’s a good update for LinkedIn, and it’ll enable users to more accurately, and succinctly, communicate their experience within a company. It may also give more users motivation to list their different roles at each organization more specifically, which can also be important – LinkedIn says that user profiles are viewed up to 29x more if you have more than one position listed in your ‘Experience’ section. And while some users may want to further highlight key roles within their company tenure, LinkedIn notes that the best way to specify key shifts is within your ‘Summary’ section, as opposed to making them stand out within your ‘Experience’ listings. As noted, it seems like a good update, and will no doubt make it easier for profile visitors to get a better understanding of your career progression. You might want to keep an eye on your profile for the change as it comes through to ensure you understand how it will look.